The Two Noble Kinsmen, derived from Chaucer's Canterbury Tales, begins as Athens defeats Thebes in war. Arcite and Palamon, Theban knights and devoted cousins, are imprisoned in Athens. From their cell, they see Emilia, the sister-in-law of Theseus, Duke of Athens. Both fall in love with her, becoming bitter rivals. Arcite is released but, for love of Emilia, stays in Athens at the risk of his life. The jailer's daughter, who loves Palamon, helps him escape, but goes mad with anxiety. Her original wooer cures her by courting her while pretending to be Palamon. Arcite encounters Palamon and challenges him to formal combat for Emilia. Theseus discovers them before they duel. He first sentences both to death, but then establishes a contest in which each will participate with Theban comrades. The loser and his knights will die. The winner will wed Emilia. Arcite prays to Mars for victory; Palamon, to Venus for Emilia's love. Both prayers are answered. Arcite wins, but dies after a riding accident. Palamon, spared from execution, marries Emilia. 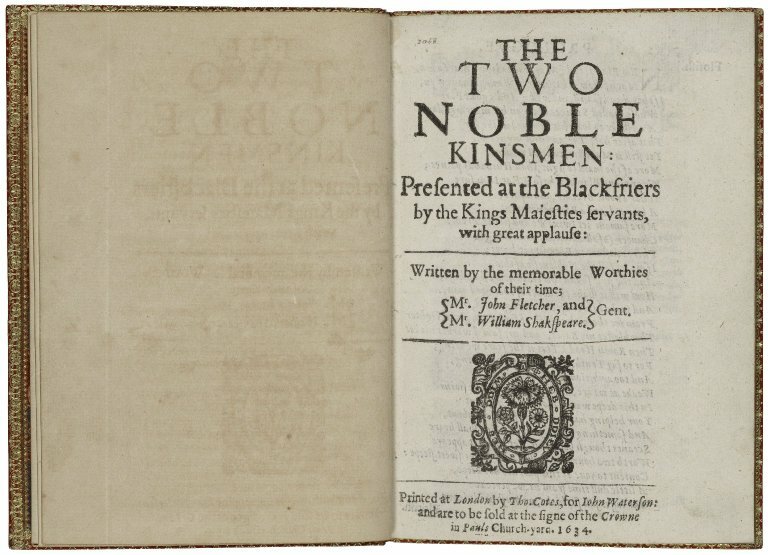 The Two Noble Kinsmen was first printed in 1634 as a quarto titled The two noble kinsmen: presented at the Blackfriers by the Kings Maiesties servants, with great applause: written by the memorable worthies of their time. Mr. Iohn Fletcher, and Mr. William Shakspeare. Gent. In 1679, it was included in the collection of plays by John Fletcher and Francis Beaumont, but it was not until the 20th century that it came to be part of the standard Shakespeare canon. Two Noble Kinsmen is thus, along with Pericles, one of the very few plays that was not included in the 1623 First Folio that is today recognized as Shakespearean. The two noble kinsmen: presented at the Blackfriers by the Kings Maiesties servants, with great applause: written by the memorable worthies of their time.